I’m definitely someone who works better when I have a plan in place and a good idea of what I’m doing each day. I thought I would share how I stay organised and plan my week as a freelancer. 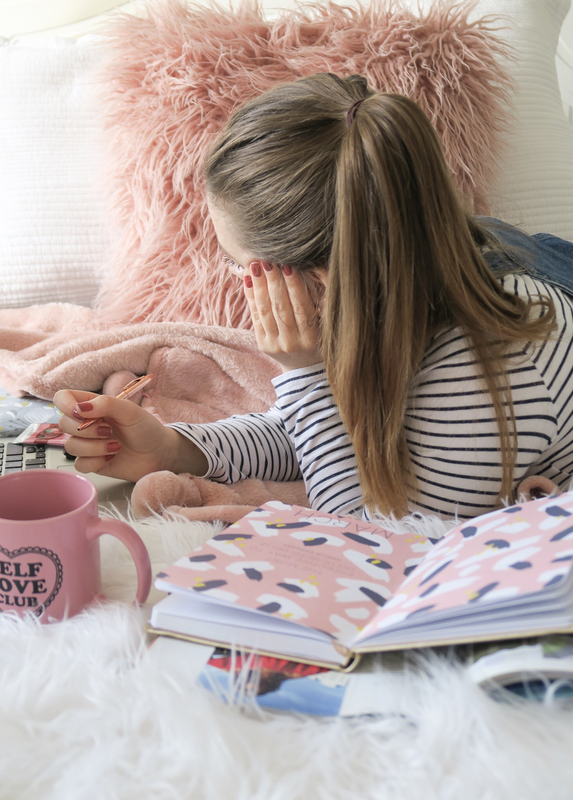 Keeping organising is super important as a freelancer when you’re the boss and as a blogger, as it’s great for keeping consistent and ensuring you publish great quality content. So how do I plan and organise my week as a freelancer? Some people prefer writing to-do lists at the beginning of the week for the full week or the night before each day, but for me, I like to write my to-do list in the morning of that particular day. Some important tasks will already be scheduled in previously as a reminder. So all that’s left for me to do is write out which tasks I’m going to be focusing on for that day. To do this I use my goals diary from BusyB to write my to-do list for whichever day it is. Sometimes on a Sunday night, I will do a list for the day before just so I feel more organised, but mostly I do it in the morning. Like I mentioned, I use the goals diary from BusyB and in this diary, it gives me the option to note down three goals that I want to focus on for that week. I do this on a Sunday night as it’s a nice way to begin the week with a fresh focus. It also gives me a chance to reflect back on the previous week and see how my goals for that week were coming along. If things went well, then I’ll give myself some mental praise and if things maybe didn’t go to plan, then I’ll either bring the goal for this week or remember to work on it some other time. Setting goals each week really does help me to keep organised with getting things done and is essential step in my planning process. Aside from writing my to-do list each day and coming up with some goals to follow, I also like to look over the whole week and give myself a clear idea of what needs to be done each day. Over the past few months, I have got into a pretty good working from home routine. Although just recently I have got a little busier so it has meant I have had to accustom to that, but being flexible really has helped me to make time for those important tasks, as well as looking after myself and making sure I make time to relax and do non-work related tasks. I like to keep similar tasks following through from one week to the next. For example, Monday I like to take some bulk photos for Monday, Tuesday and Wednesday’s content on both the blog and Instagram. Then on Tuesday and Thursday, I like to make sure I schedule in a workout those days and I also use Thursday to shoot content for Thursday, Friday and the weekend. On Wednesday, I’m pretty busy doing non-work related things most of the day, so I have to make sure I use the time I do have on a Wednesday to the more important tasks as I am limited with how flexible I can be on that day. Friday’s used to be the day when I had a slow living day but as I have got busier I have had to ditch my slower morning and now make time for it at the weekend or another day during the week. It’s all about switching things up and finding what works for you when it comes to planning and keeping organised. How do you organise and plan your week? As a fellow freelancer, I definitely love a good list! Because I work full-time and freelance/blog on my off time, I tend to write a weekly to-do list so I have a rough idea of what I have to get though, and then each day I write a smaller list to complete. It can be so hard to stay motivated and on task when you’re your own boss, but at least I know I’m not alone! Thank you for the organizational inspo! Love that you work as Freelancer! I didn’t know that 🙂 Loved that post!